First of all--yes, I admit it--I am quite behind in my blogging. I mean, I was supposed to do this post sometime in December, but then, well, I really did not even finish these gifts until yesterday--that's right, yesterday. BUT, these are for the kiddies in my life so I know they do not mind--and may even appreciate the gifts more right now in this dull, post-holiday world where the presents have all been ripped open, the cookies have been eaten, the string of rellies has gone, and it is another whole year until Santa comes. This is my rationalization, anyway. 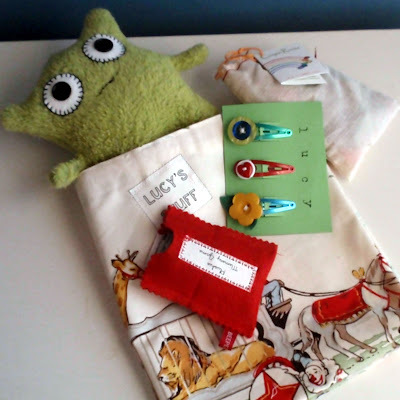 But nonetheless, I still want to share these little sacks of gifts I made for the lovely little kiddies who are part of my world. First, I made these button barrettes for the girls. They were inspired by the Martha Stewart hair pins here, but I thought barrettes seemed more practical for a group of rough and tumble pre-school girls. 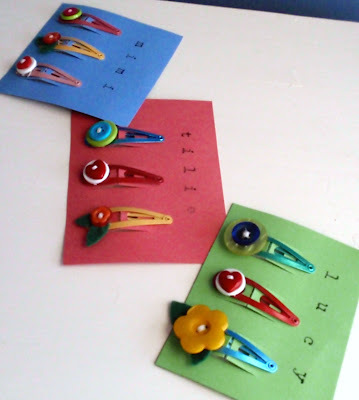 They are simple to make--using some good, sturdy thread, sew the buttons to the barrettes (I doubled some buttons up, or added tiny wool felt leaves too), then make a little personalized card to pin them to (we used card stock scraps we had laying around). And then this is something I had an idea about lurking in my head for some time--a Beeper Bebe Plushie Memory Game. 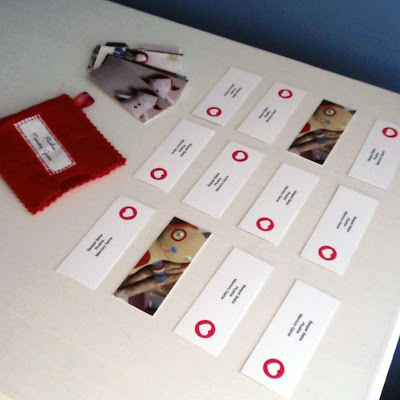 I made these from Moo mini cards I had made especially for this purpose (and I may offer some in my shop in the future too for general consumption). 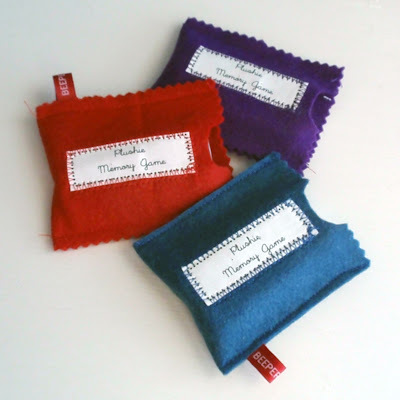 I simply matched up several sets of images, and then made these little wool felt cases with labels to put them in. I think all kids love this game--and it is a great game for pre-schoolers who have memories like steel traps. 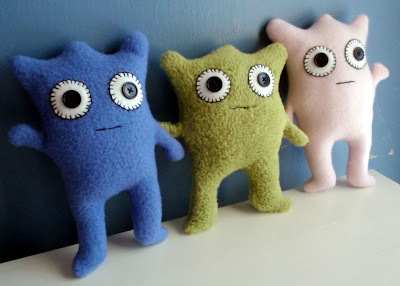 And then, after making some of these little monsters for the Toy Society Christmas drop earlier (read about it here), I just sorta fell in love with them and decided I had to make some more for the kids--these are made from reclaimed fleece. 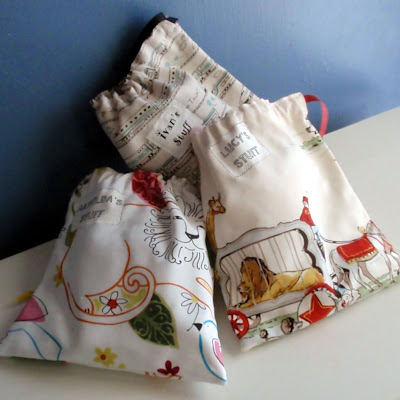 And finally, I made these simply little draw-string sacks to stash all the goodies in, personalizing them with a name label. I figured this is an eco-friendly (albeit time consuming) alternative to gift wrap since the kids will keep and use these. I also threw in my favorite little kids item that I gave to all the kiddies this year--crayon rocks from Stubby Pencil Studio--made from eco-friendly soy wax and tinted with natural mineral powders, and a little sack of 16 is only $6.95! And finally, I made these just for the babies in my life. 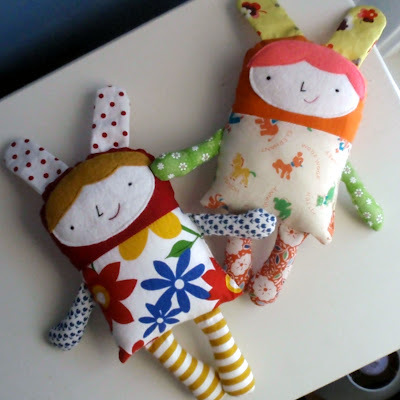 They were made from the Nest Studio's Polly pattern in the book, Softies. And with that, I am officially done with Christmas gift making and blogging about it. Now back to our regularily scheduled blogging. the sacks are really nice! I did something like that for my son's 6th birthday and filled them with candies (http://www.flickr.com/photos/mamiatheart/4970314253/). It is a good idea to personalize them, I'll keep it in mind for next time.